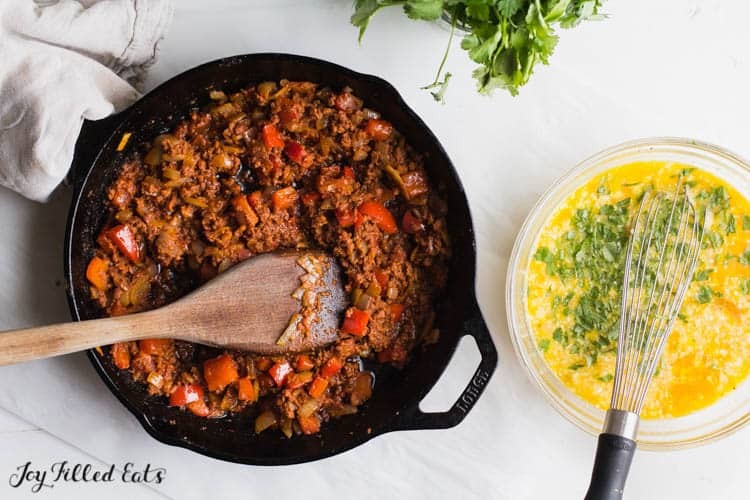 This Keto Frittata with Chorizo makes the perfect breakfast or brunch, and it can easily be prepped in advance for a make-ahead breakfast. It’s also gluten-free and grain-free! Hi! I’m Sarah. I’m so excited to be here at Joy Filled Eats. I’m a mama of four-year-old twins and a one-year-old. When I’m not chasing them around, I write about food, faith, creativity, and motherhood at sarahjhauser.com. I’m a bit of an omnivore, and I love sharing wholesome recipes for everyday life that fit a variety of lifestyles. Our food can be a powerful means to bring us together, and there’s so much joy (even amidst the chaos) to be found at the table. In addition to my blog, you can also find me on Instagram (@sarah.j.hauser) and Facebook (/sarahjhauser). My day typically starts when my one-year-old cries, “Mama!” from his crib. I always tell myself I’m going to wake up before my kids, but every morning that snooze button proves irresistible. And so I roll out of bed to retrieve my youngest and then head to the kitchen to get started on breakfast for him and his two siblings. Just like my kids, I have to eat a good breakfast in the morning. A granola bar just doesn’t cut it for me. I notice hunger strike just an hour or two later or a crash in my energy level if I don’t eat a protein-rich meal. But too often, starting my day with the cries of my kids means my breakfast gets put on the backburner. 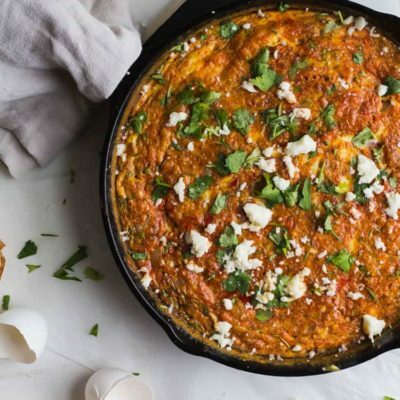 Enter the keto frittata. In this season of life, with four-year-old twins and a one-year-old, I’ve embraced make-ahead meals and meals that will feed us all week long. This dish is perfect for that. 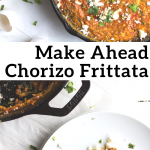 I can make this Chorizo Frittata on Monday morning and have enough for a week’s worth of breakfast for my husband and me. Or, I can prep it on a Friday night for a hearty weekend brunch (and plenty of leftovers!). It’s also a great mix-and-match recipe. Instead of chorizo and queso fresco, saute crumbled Italian sausage and mix in fresh mozzarella. You can even add in my Breakfast Slow Cooker Pulled Pork. Or in lieu of a meat-heavy dish, load it up with vegetables like mushrooms and tomatoes. While I love the way the recipe is written below, it’s definitely a dish you can adjust according to whatever is left in your fridge. My family also loves my Mushroom & Leek Frittata. Chorizo is a spicy Spanish pork sausage. 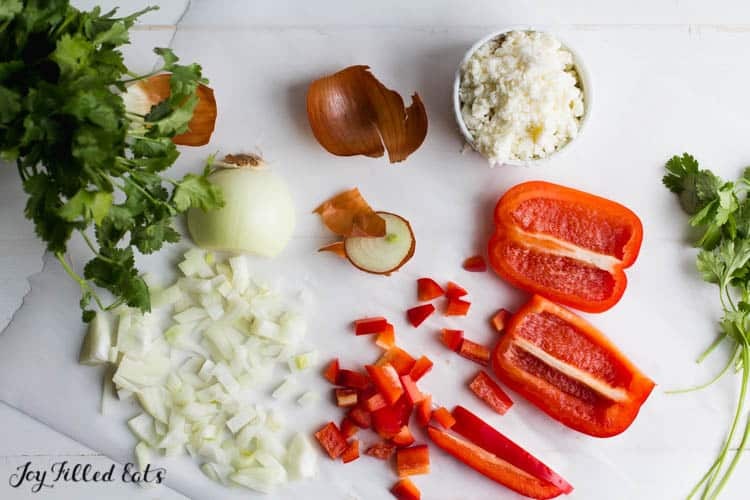 You can buy a mild version too which is what I use in this healthy frittata. For this recipe, I used queso fresco, a Mexican cheese typically made from cow’s milk or a mix of cow and goat milk. It’s a fresh, crumbly cheese that has a bit of tang, so it helps balance out the richness of the chorizo. If you like, you could try substituting other cheeses such as cheddar. What’s the difference between a frittata and a quiche? 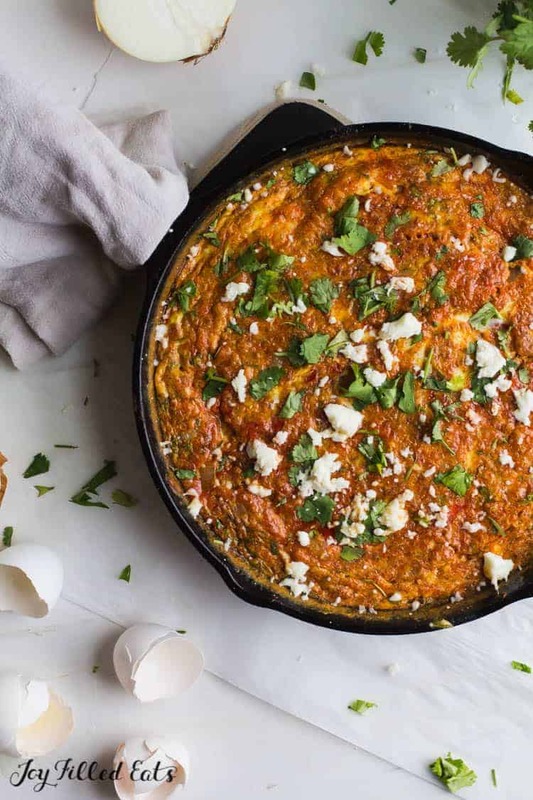 A frittata is first cooked on the stovetop and then finished in the same pan in the oven. This is a great method to use when you have to saute vegetables or brown meat before adding the eggs. A quiche normally has a crust and is baked in the oven. Yup! It’s just eggs, cheese, veggies, and chorizo. 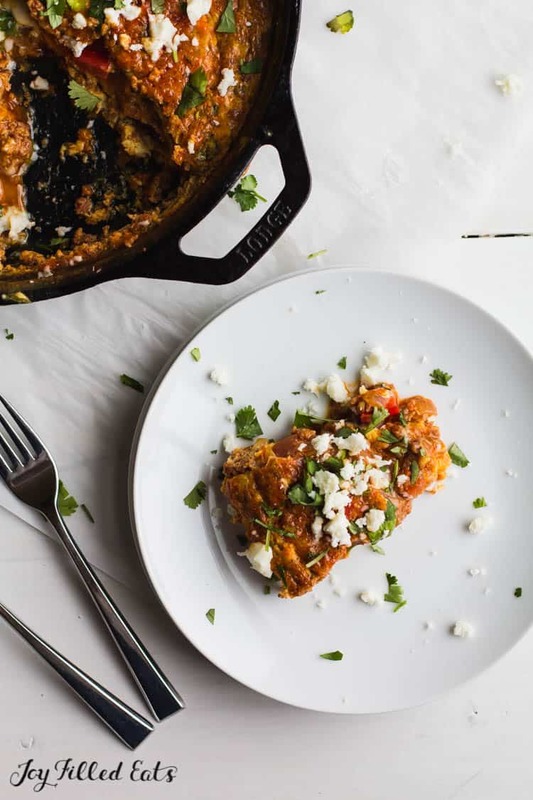 Try serving this dish alongside fresh fruit, tender greens with a splash of oil and vinegar, or hashbrown casserole. It makes a great brunch dish or can be enjoyed on its own. If you’d like to pair it with something sweet try this Mixed Berry Chia Pudding. After cooking the frittata, I love topping it with fresh cilantro. This bright herb adds a freshness to a hearty egg dish. If you aren’t a cilantro lover, though (my husband says it tastes like soap), you could always substitute fresh parsley instead. Or, if you’re like me, just heat up leftovers in the microwave and snag a few bites while you chase down your kiddos. In a 9- to 10-inch cast-iron or other ovenproof skillet, heat the olive oil over medium heat. Add the diced onion and bell pepper. Sauté for 5-6 minutes or until softened. Add the chorizo, breaking up the pieces with a wooden spoon. Cook for about 5 more minutes, and then turn off the heat. 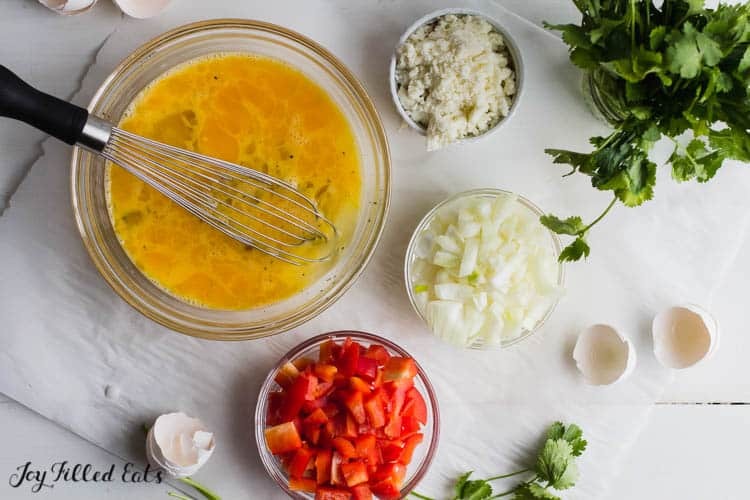 While the chorizo cooks, in a large bowl, whisk together the eggs, queso fresco, milk, cilantro, salt, and black pepper. Pour the egg mixture over the chorizo, and give everything a stir. Remove from the oven and let sit for 5 minutes. Slice and top with more crumbled queso fresco and chopped cilantro. What a delicious, healthy, colorful dish! 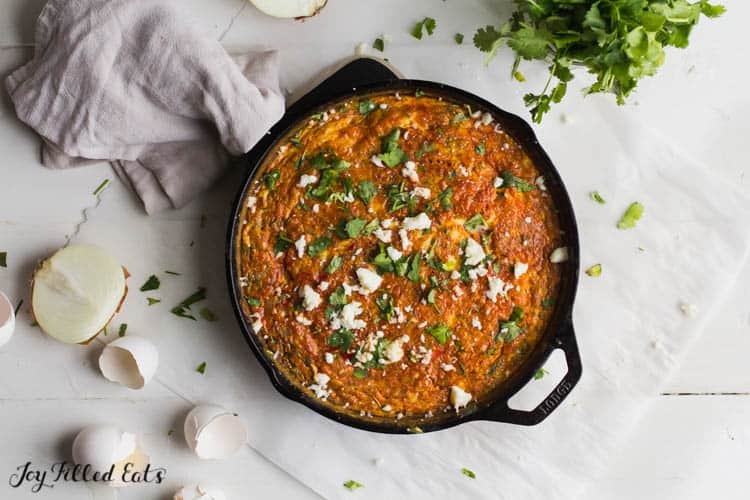 This lovely keto frittata is perfect for Sunday Brunch! I love that it's made in a cast-iron pan. It's presentation on the tabletop is stunning!